Two weeks ago, I volunteered to make some fresh chunky salsa for my wonderful beau's family dinner. I'd returned late from Cedar City, so I quickly ran to the gym and then to the store before the exhaustion set in. Chop. Chop. Chop. That's kinda how it went with the vegetables without any incident. I dug through the trash to find the tie that had been around the cilantro. Nope - definitely not cilantro. I'd somehow grabbed Parsley. Back to the store I went at 11pm. I was feeling somewhat silly about my mishap until last night when I was at the store with my beau. We decided to make a delicious-looking quinoa recipe to divide up for quick meals through the week and we needed cilantro. He headed straight to the parsley. Can you tell which is which at first glance? My first instinct was the first is italian flat leafy parsley and the second is cilantro, but the more I look the more I second guess myself. I see from the links my first instinct was entirely wrong. In fact, I think I've made that mistake myself from time to time. I can, but that's because I'm sort of a cilantro nut. I don't use my eyes when picking out cilantro. I use my nose. I think grocers get upset with me for shoving this big bouquet of green stuff up into my ruggedly bearded face. I've almost done this a few times, but luckily I always smell them because I love cilantro! Good thing you found more for the salsa, yum! 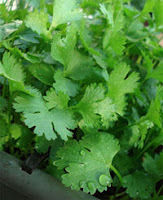 Cilantro is disgusting and not fit for human consumption. Parsley is good though.